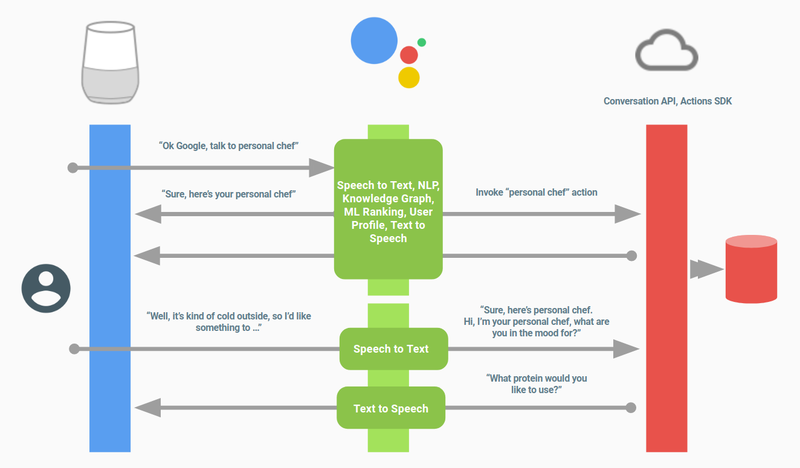 In today's post I'm going to show how to develop a simple app for the Google Assistant. For developing this app, I will be using the Actions SDK. My next post will use Dialogflow (formerly api.ai) instead. After reading both posts you hopefully will know enough to decide which approach is better suited for you. In my home town I usually take the bus when taking our youngest to kindergarten before heading off to work. In winter and also due to some long-lasting street works, one of the two lines near our home is quite late all the time. But naturally unreliably so. So I wonder every morning when to leave for the bus. We do have an app for bus information in Münster - but some limitations of this app make it not really suitable for the task. Thus an assistant app that tells me when the next busses are due and whether we should hurry up or whether we can idle around a bit more is what I'm going to build. The first version in this post with the Actions SDK. Then in the next post an improved version with Dialogflow. On the right is what I'm going to speak. On the left are the assistant's answers. The first is by the assistant itself - I changed the color for that one to emphasize the difference. The second and third are responses of the app. After the last response the app finishes - and with this also the current assistant's action. Thanks to botsociety.io, you can even see this website showcasing this prototype. 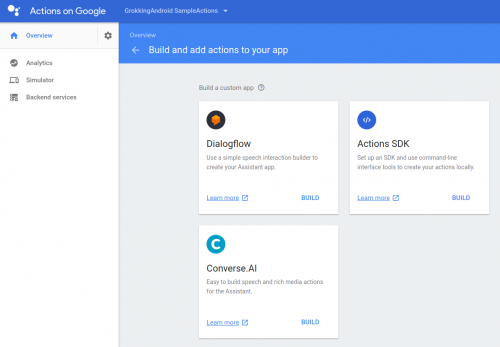 The Actions SDK is one way to develop apps for the Google Assistant. As the name of the SDK implies you can create actions which basically are speech snippets of your user and your response to them. Let's go a bit more into the base concepts here. An action is a wrapper combining an intent and the fulfillment for this intent. For a truly conversational app, where there's a dialog between the user and the assistant, apps have multiple actions. But often it makes sense to create a one-shot app. In this case the app has only one action and answers directly with the response the user is looking for. The sample app would work well as a one-shot app. I only added one more action to make it a better sample for this post. We already know intents from Android. And with Actions on Google they are not much different. An intent specifies what the user intends your app to do. In contrast to Android, though, you are very limited when it comes to intents with the Actions SDK. Every app has to define one actions.intent.MAIN intent, that is used to start up your app, if no custom intent is better suited to the invocation phrase. Depending on your kind of app, this intent might directly provide the answer and then stop the app. Or it might kind of introduce the app to the user in some way. For the start of your app you can also define custom intents and which user utterances trigger that intent. You might even add some parameters to that (for example numbers or a date). And if the Assistant detects that one of those phrases was used by the user, it starts up your app using this intent. If you were to build a more complex app with the Actions SDK, you would use one intent most of the time: actions.intent.TEXT. Meaning: You have one intent that has to deal with nearly all possible user input. And thus your app would have to decide what to do based on the text spoken or typed in by the user. There are a few more intents available. For example android.intent.OPTION which is useful if you provide a set of options to the user of which she might select one. But when dealing with user input most of the time you would have to deal with actions.intent.TEXT. This limitation is the reason why I've written in my intro post about the Assistant, that the Action SDK is mostly useful when you are proficient with natural language processing or have a simple project with a command like interface. 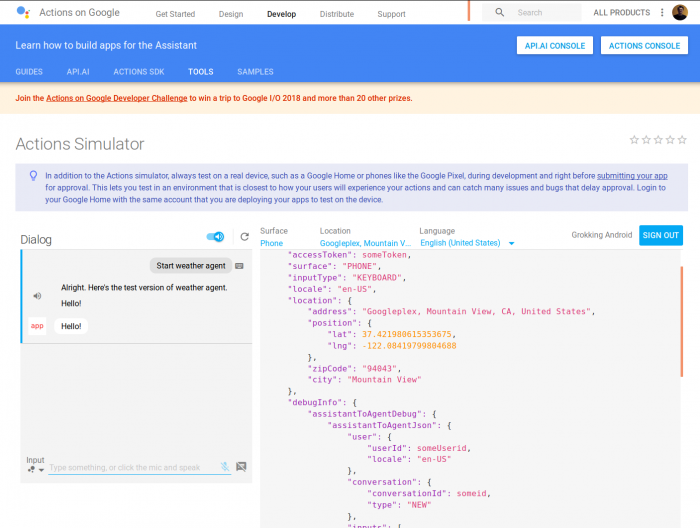 ⇨ Use the Actions SDK for one-shot apps. These are apps that provide the required answer directly after being invoked and then stop. They give you just this one result. A typical example would be setting a timer to ten minutes. ⇨ For all other apps, for those that are really conversational, where there are multiple paths to follow and where you want your user to provide more information during the conversation, I recommend to use Dialogflow (api.ai) instead of the Actions SDK. I will cover Dialogflow in my next post. Fulfillment is just another word for your backend. Every action must be backed by some backend of yours. This is where you generate the text spoken to the user. Or — on devices that have a graphical user interface — that's where you create visual cues for your user. Of course the response is based on which intent was triggered and what additional cues the user gave in her question. In this post I'm only going to make use of some of them, but I'm going to cover more aspects in future posts. The next picture shows where your app — or more precisely: your fulfillment code — fits into the overall picture. The assistant knows which app to call based on the invocation phrase used by the user. It also provides voice recognition of the user utterances and text to speech transformation of your answers to the user. Your app then takes the recognized text and creates an appropriate response for that. Action SDK workflow - picture © Google, Inc. In the next paragraphs I'm going to cover those steps. As you can see, there are three prominent ways to develop apps: The Actions SDK or one of the two services Dialogflow or Converse AI. If you click on "Actions SDK" you will see a tiny popup where you can copy a gactions command. So the next step is to install the gactions command line tool. You can download the gactions tool from Google's site. It's a binary file you can store, wherever you see fit. Make sure to make this file executable (if you're using Linux or Mac OS X) and - since you're going to use this tool a lot - I recommend to add it to your PATH. The last step is to simply initialize your project. Afterwards you're set to start developing actions using the Actions SDK. Simply create some folder in which you whish to create the project and then switch to this folder. If you have never run gactions before, it will require authorization to access the Actions Console. Simply follow the steps outlined on the command line. After pasting your authorization code into the command line, Google gets your access token which is used for all subsequent communication between the gactions tool and the Actions Console. If you ever want to use another account, simply remove the creds.data file. The gactions init command will create a file named action.json. This file contains the configuration of your project. In it's current state it's content is not valid. It contains plenty of <INSERT YOUR ... HERE> markers. You are going to fill those in in the remainder of this post. With this you have finished the preparations and are good to go. So let's start creating an action. "conversationName": "<INSERT YOUR CONVERSATION NAME HERE>"
"talk to <INSERT YOUR NAME HERE>"
"url": "<INSERT YOUR FULLFILLMENT URL HERE>"
As you can see, some objects match the concepts explained above. At the top you have the actions object, which contains an array of action objects - each of which contains one intent. The second object is named conversations, which contains a map of conversation objects. I don't know why it's named "conversations", but basically this object covers the description of where to find the app's fulfillment. You can see the full specs in the reference section for Actions on Google. The sample app has one intent to deal with the start of the app - the actions.intent.MAIN intent. This app is a good example for a one-shot app - meaning it would provide the answer directly with the actions.intent.MAIN intent and finish itself directly after giving the answer. 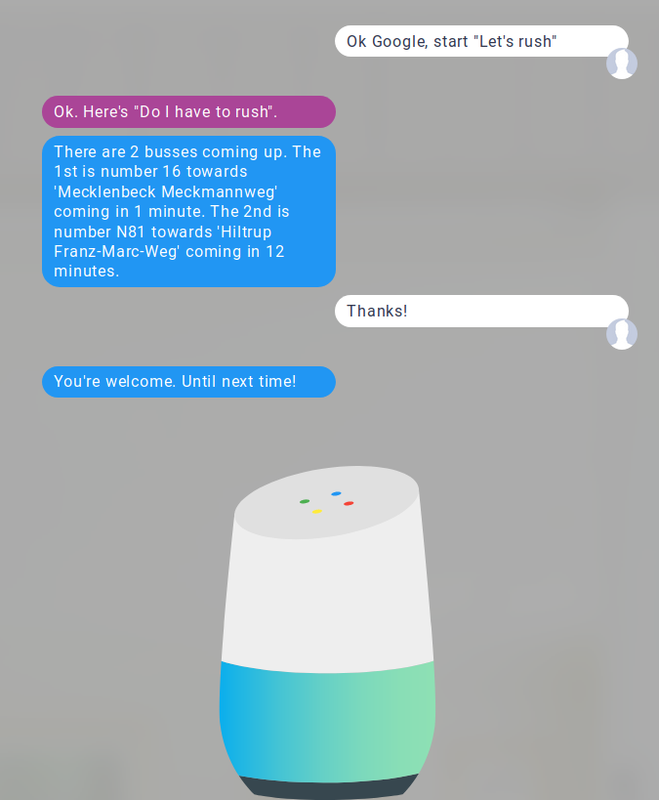 To make this tutorial more useful, I've added the possibility for the user to acknowledge the answer of the app before it ends itself and gives the control back to the assistant. And - if the user didn't understand the answer - she can ask for a repetition. Thus there is one intent of type actions.intent.TEXT that deals with both of these follow-up responses by the user and that also provides an answer in case the app doesn't understand the user's intention. The intent represents the type of information the user tells the app. You first have to specify a name for this intent and then you have to define how this intent can be triggered by the user. So basically what the user has to say, in order for the assistant to select this intent. As you can see from the Json above, the trigger contains an array of possible phrases. You can use it for custom intents - but also for the initial, the main intent. My sample app has the name "Do I have to Rush".1) But the user might use other phrases to trigger your app. In the prototype shown at the beginning of this post, I am using "Let's rush". And that is working as well because I added that phrase to the trigger section of the intent. For actions.intent.TEXT intents you do not need to specify trigger phrases - since this intent gets called automatically for follow-up phrases of the user. The above file is still incomplete. While the fulfillments link to a conversation, the conversation's URL is still not set. I will add that information after I've created the function in the next section. I am using Cloud Functions for Firebase - and the URL can only be set after deploying for the first time. About time to delve into the fulfillment code. In the config file you specified how many and which intents you have. In your fulfillment you have to provide the responses to these intents. That is: You tell the assistant what to say to the user and - if the device is capable of those - what visual elements to show the user. Note that there is also an unofficial Kotlin port available. I haven't had a look at it, since I prefer to use Cloud Functions. Anyway: If anyone has experience with it, please let me know in the comments or on social media. Assuming you have created the necessary structure with firebase init the next step is to add Google's library to your project. 1.5.0 is the most recent version while writing this post. But when you read this, the newest version might very well have a higher version number since Google is eagerly working on everything related to the Google Assistant. * This function is exposed via Firebase Cloud Functions. * closest busstop to our home. * Note: Your fulfillment must respond within five seconds. Note that you are using a specific part of the actions-on-google lib. You only need the ActionsSdkApp. In my next post about Dialogflow this will change and you will use the DialogflowApp instead. You must not forget the specific part you are interested in nor must you use the wrong one. One thing you need to know: In its samples, Google usually uses an ActionsSdk alias for the ActionsSdkApp class. When you have added the lib and create the object, you can use the app object to query for information about the request and to provide the answer to the user. // all follow-up requests will trigger the next intent. // Be sure to include it. Now I'm not going to show all I've done within those functions. I simply highlight some specific aspects, that are important to understand the Actions SDK. // to the user; I omit this for this simple usecase. So sometimes I call app.ask() with a text and in one case I call app.tell(). Even though the former is named "ask" it doesn't necessarily mean it has to be a question. In my case the answer is presented using ask(). But ask() keeps the conversation alive. It basically expect another user reaction. The tell() method on the other hand doesn't expect a user reaction. In fact it closes the conversation and passes the baton back to the Assistant itself. Of course there are more options available than just to ask or to tell, but I won't go into them. // need the appropriate permission. While the usefulness of the userId depends on a few factors, the conversationId is nearly always useful. For one, you can use it to store conversation state on your backend. Since you only have limited possibilities to keep a conversational state with Actions on Google this id can be used as a key for that. A second good use for the conversationId is for tracking down problems by using this id within all of your log messages and thus enabling you to join all log messages of one conversation together. If you have deployed your code to Firebase and configured your action.json file, all you have to do, is to deploy your app to the Actions Console. 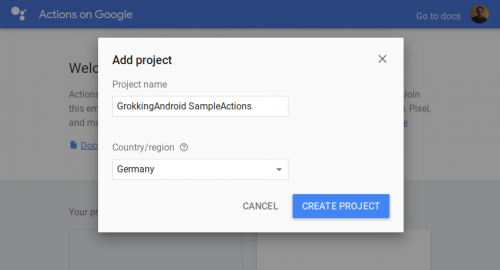 Actually all Google needs, is your actions.json file - or files in case of internationalized apps. It's not as if you deploy code to the Actions Console. You only define your actions and where to find your code. 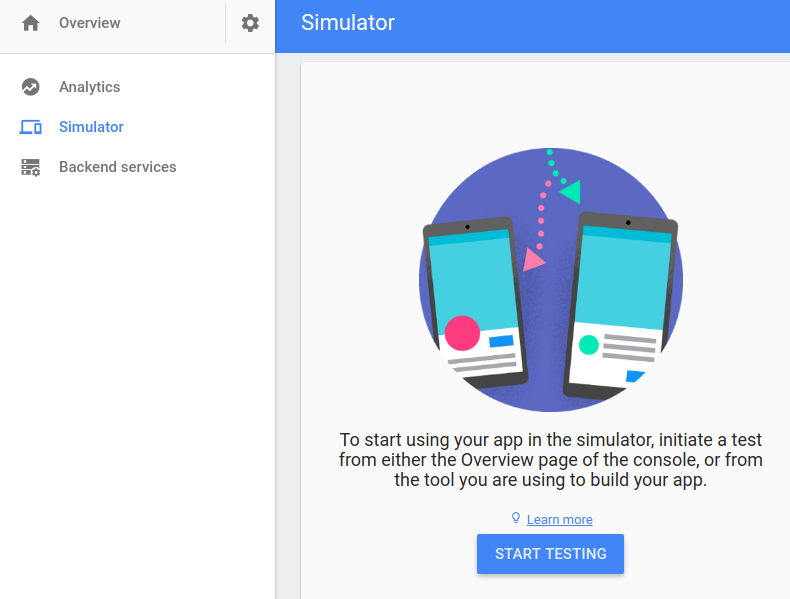 You can test your app also on your Google Home, your Android or iOS devices and on any other device that offers the assistant (for example the AIY based devices). To do so, those devices must use the same account and must match the locale of your test. But you can also enable testing in the Actions Console. 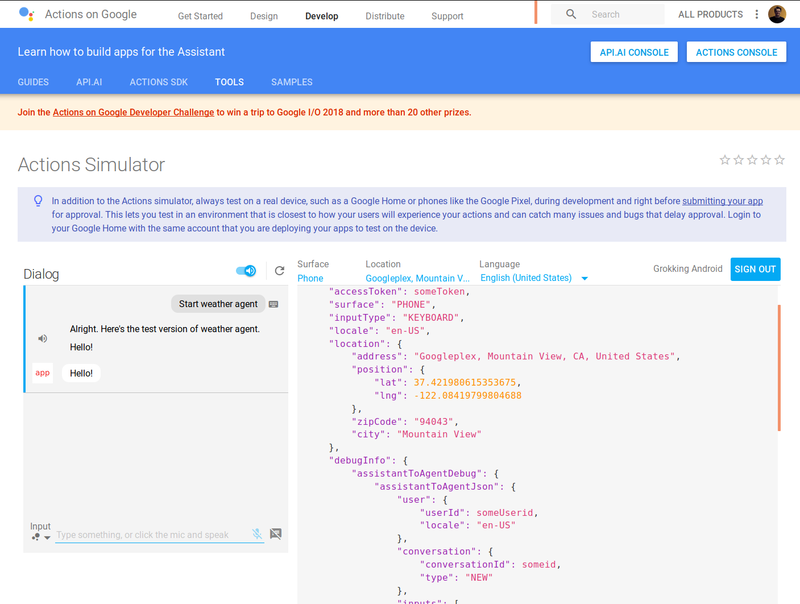 Simply go to your project and click on the "Simulator" link in the menu on the left and than click the "Start Testing" button. While writing this, I do not see this button for one project or get an error when trying to enable testing via command line due to a glitch on Google's side. As I've mentioned, Google is working a lot on Actions on Google. The downside of this is, that there are occassional hiccups. One this week, one last week. In both cases, though, the response by the Google team (alerted via the Actions on Google community on Google+) was quick and helpful. For more detailed code see my ActionsSDK sample project on github. On github you find the full implementation of the sample app outlined at the beginning of this post. The project only contains the cloud function's code and the action.json file. So be sure to follow the relevant steps of this tutorial for deploying the function and deploying the project to the Actions Console. Thus for anything other than one-shot apps I recommend to use Dialogflow. In one of my next posts, I'm going to improve upon this app by switching to Dialogflow. Ok, Google dear reader, what's your take on this? What are you going to do with the Actions SDK? Please let me know. 1. ↑ According to the invocation recommendations by Google, "Do I have to rush" is not a good name. You should try to find more concise and still expressive names for your projects. 2. ↑ In my sample app on github I am using outbound http traffic. As you can see on the pricing information for Firebase, you cannot do so with the cost-free Spark plan. So I've configured my project to used the Blaze plan, the pay as you go plan. 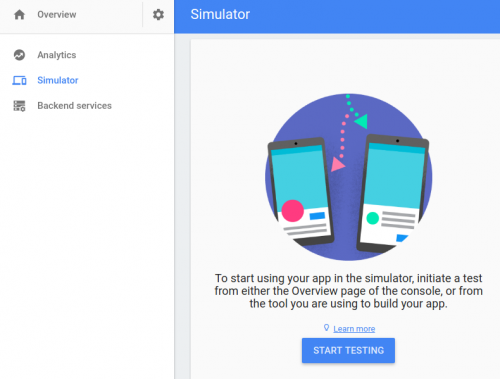 Even with this plan you have a significantly sized free tier - meaning free invocations, free CPU usage and free outbound traffic that should be more than sufficient for getting used with the Actions SDK and using Cloud Functions for Firebase for testing purposes. But still: You must have billing enabled and you might run into costs.